On 26 August 2014, the house of human rights defender Ms Damaris Moya Portieles was raided by state security agents. Since 30 August 2014, the house has been under surveillance. This is the most recent in a series of break-ins, raids and attacks on the human rights defender and her family at their home. Damaris Moya Portieles is an activist and member of the Movimiento Femenino por los Derechos Civiles Rosa Parks (Rosa Parks Feminist Movement for Civil Rights) and is Vice-President of the Coalición Central Opositora (Central Opposition Coalition), which works to protect the well-being of children and the elderly and has protested against unjust evictions carried out by government forces. The raid at her house took place after state security agents learned that ex-political prisoner Luis Enrique Santos Caballero wanted to take refuge at the human rights defender's house. On 26 August 2014, a state security agent forcibly entered her home and physically attacked Damaris Moya Portieles' daughter. The state security agent also threatened the human rights defender and her son. On 13 March 2014, the women human rights defender was detained within the vicinity of the headquarters of the Frente Nacional de Resistencia Cívica Orlando Zapata Tamayo – Frente OZT (the 'Orlando Zapata Tamayo' National Front of Civic Resistance) in order to prevent her participation in the weekly meeting of the Frente OZT committee. 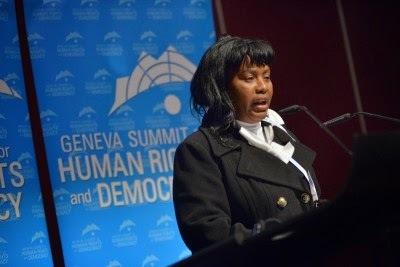 On 25 February 2014, Damaris Moya Portieles participated in the Geneva Summit for Human Rights and Democracy by presenting a speech on her human rights work in Cuba. The repression against the human rights defender and her children has been constant. Front Line Defenders issued an Urgent Appeal on 7 January 2014 after her 5-year-old son and 8-year-old daughter were assaulted by state security agents in Santa Clara, and required medical treatment. Furthermore, on 10 October 2013 Damaris Moya Portieles was beaten unconscious and arrested by Cuban police while at home with her two young children. Front Line Defenders remains gravely concerned by the risk of physical attack facing Damaris Moya Portieles and her family, especially in light of her international advocacy in Geneva earlier in 2014. To read more about the attacks against Damaris Moya Portieles, please visit her Front Line Defenders page here.